These maps will guide you to the peaks of the Yorkshire Three Peaks Challenge taking in the summits of Pen-y-ghent, Whernside and Ingleborough – usually in that order. To truly meet the Challenge you are supposed to reach the summit of all three in under 12 hours. 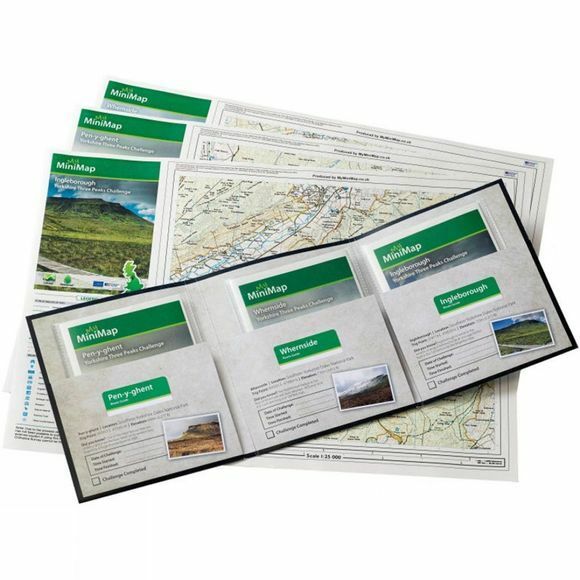 For those who may prefer to enjoy the journey and linger a little longer to really make the most of some stunning views these MiniMaps will help to make the route finding and referencing a whole lot easier. MiniMaps are pocket sized, waterproof walking maps that use 1:25,000 scale Ordnance Survey mapping. No Origami skills required, Minimaps are easy to unfold, view, and when you're sure you're on the right path, to tuck away in a small, easily accessed place. This pack includes 3 x 1:25,000 scale maps printed on A3 sized paper. They cover just the Three Peaks, with route guide cards for each peak.